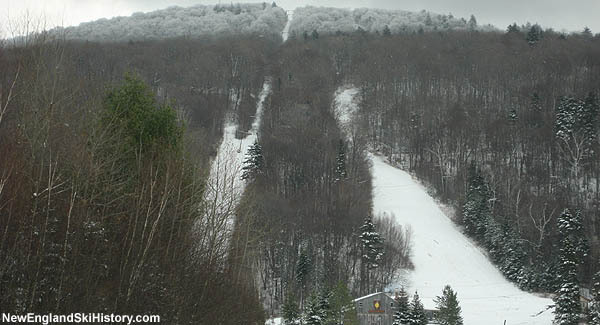 Located east of Bennington, Prospect Mountain has a long history of nordic and alpine skiing. With a base elevation of over 2,000 feet, the area often receives and retains natural snow whilst other areas are bare. Lift served skiing on Prospect Mountain may have started as early as the 1935-36 season, when Alexander Drysdale's Ski Tow (aka Hedgehog Hovel Ski Area) operated on a small slope near the footprint of the later T-Bar area. This operation likely continued until World War II. 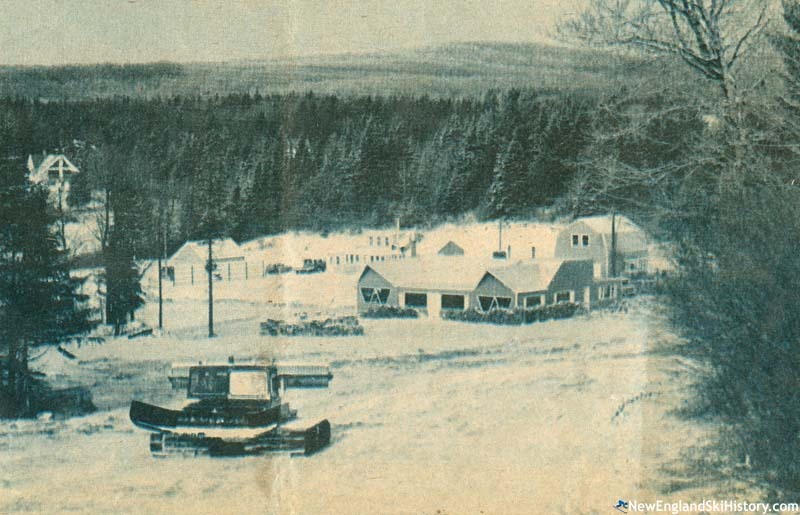 In 1938 or 1939, Mundell built a base lodge and lower mountain ski area within the footprint of the later T-Bar area, perhaps operating at Woodford Ski Trails. The area likely closed after 1940-41 season due to the onset of World War II. The area operated to some extent after World War II. William Morse, with a contract to rebuild Route 9 from Bennington, likely reopened Prospect in 1961-62 with a new 3,200 foot long T-Bar. With the new lift and vertical drop expanded to some 675 feet, Prospect Mountain was now a mid-sized ski area. Growth continued the following season when a 1,200 foot long T-Bar lift was possibly added (though it may not have opened until 1963-64). Around this time, Prospect sported 8 trails and 1 slope. Morse sold the ski area to Bennington attorney Joseph Parks in October of 1978. Night skiing and cross country skiing (the former Timberlane Trails touring center) operations were added for 1979-1980. Also during Parks' second season as owner, the main T-Bar was converted from gas to electric and the main lodge renovated. While the late 1970s investments were made in hopes of improving the alpine business, the early 1980s did not prove fruitful. By the mid 1980s, Parks was considering shutting down the alpine operations. While he was convinced not to do so by a friend, the lack of snowmaking and chairlifts ate away at the area's prospects. Steve Whitham purchased Prospect in 1991 and chose to focus on cross country ski operations thereafter, resulting in the end of alpine skiing at the area. The cross country ski area continues to be popular to this day, hosting regional races each winter. The cross country network is composed of over 30 kilometers of trails, including some that weave through the old alpine ski area. While the T-Bars remain standing, there are no plans to ever operate them again. "From the historical information above there is a gap in the ownership of Prospect Mt between 1941-1961. Sometime between 1950-1960 my grandfather's brother, John Rogers Freeman, purchased land on Woodford Mt that had a ski area, some primitive cabins with outdoor plumbing etc. John wanted to restore the place. I know this because my parents stayed at one of the cabins with John on one cold and snowy Vermont weekend. Perhaps deeds would reveal more detail. " "I skied downhill at prospect many times during the 60's. My cousins all moved to Bennington so it was close. We loved the T-bar. " "Suki lived with my mom and her family. Do you know if he is still alive and if so how to contact him?" "I literally 'grew up' on the slopes of Prospect Mountain. Started skiing there in the early 60'with my Dad when he was a member of the National Ski Patrol with the likes of Bob Martin, Dan Caditz and Don Jolivette. Victor Racicot and I would sweep the lodge and built the fire and helped his uncle, Dominic Carelli, with the snack bar just to get a free day ticket from Halsey Cushman at the ticket booth. I used to leave my skiis, poles and boots in the lodge furnace room and would hitch-hike up after school each day to get in the last few runs. I then would catch a ride back to town with Rubin Harrington or Tom Dockum who were lift operators. In the 1969 season I was even recruited to help give ski lessons to groups of kids that came 'up from the city', to stay at Ed Shea's Greenwood Lodge, by that years ski instructor, a young Japanese fellow named Suki Kotaki. In later years I found out Suki was initially involved with the early developemnt of K2 skis. I have often told people that if I were to ever hit the Mega-Lottery, I would most definitely consider purchasing the old area and re-opening it with chairlifts, snowmaking and night skiing. What great memories I have of that place. It's so sad to see it go the way so many of my childhood ski areas went like Dutch Hill, Hog Back, Sun Valley, Petersburg Pass, Rock Candy Mountain and Brodie Mountain. I have been back to Vermont many, many times over the years to ski and went back in the winter of 2013 and skiid Sugarbush and will hopefully return to ski Jay Peak this year. At 63, my skiing days are 'somewhat' numbered, but it did not stop me from buying all new equipment for this coming season!! Here's to all who learned to ski at this wonderful old hill and maybe, just maybe, before it's all over, I will win the 'big one' and reignite my childhood dream of owning my own ski area and reopening that grand old mountain. Gary Allen Mocksville, NC"
"Joe Parks did Bennington kids a great service in the 1980's with Prospect downhill. I skied there almost every winter weekend with Robert Plunkett and Matt Hier. Most of the time the T-bar worked, but if it didn't Joe would climb the ladder to the engine house, clang around up there for a while, and soon enough a puff of smoke would rise up and it would roar back to life. Some of the woods trails and citizen-skier-made jumps were second to none. -Dan Cunningham"